» Can this truck trap be fixed? Can this truck trap be fixed? Albany’s notorious First Avenue truck-munching trestle one day last month (when nothing untoward happened). 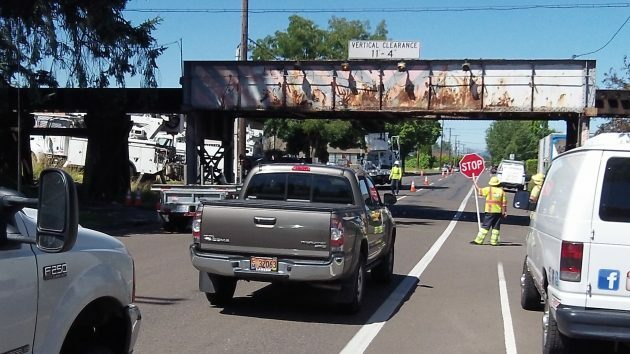 Do you think Albany will do anything else to keep trucks from hitting the railroad overpass on First Avenue? Me neither, but at least the subject came up — briefly, and without resolution — at Wednesday’s meeting of the Central Albany Revitalization Area advisory board. Mitch Langjahr, a member of the board, brought it up. Trucks have been hitting the bridge for as long as anyone can remember. And recently it’s happened more frequently. Lots of people including Mayor Sharon Konopa think this may be the result of more non-professional drivers unfamiliar with Albany or their vehicles relying on GPS for directions. When last I wrote about this in June, someone had suggested making the bridge more visible with reflective paint. On Monday, CARA board member Loyd Henion mentioned a system in which a laser beam is directed across the road at a certain height. When broken by a truck, the beam triggers a very loud and highly visible warning to “stop right now,” or words to that effect. As it happens, the downtown urban renewal plan lists the First Avenue undercrossing as one of its potential projects. With an estimated price tag of $500,000, it’s No. 37 on the list of 51 projects or activities the city council contemplated when the plan was adopted in 2001. But on this one nothing has been done. The prevailing attitude has been, pretty much, that there already is a detour for trucks, not to mention an array of warning chains dangling across the street upstream of the bridge. And what can you do if drivers ignore all that? But the fact is that this overpass is a serious departure from the norm. The Federal Highway Administration says the minimum clearance for bridges on collectors and local streets is 14 feet. Trucks generally are no taller than 13-6. This overpass cuts them off if they are higher than 11-4. Professional truckers know how to avoid such trouble spots. But maybe not, in the words of Councilman Rich Kellum, some guy driving a big rental helping his daughter move. And maybe not the Sunday driver of a motor home with all kinds of stuff on the roof. Lowering the street some more is not the answer. Councilman Floyd Collins, a former public works director, says doing so would put nearby shops out of business by cutting off their driveways. But something should be done, something that involves paint and an automated warning system that drivers can’t ignore. Note: The original version of this story had this meeting taking pace Monday. It was on Wednesday, of course. 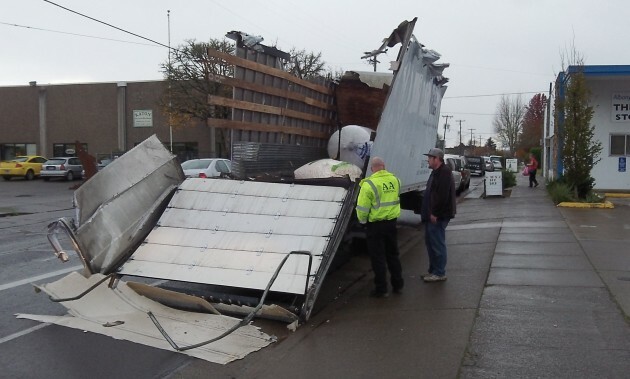 This truck was ripped open on First Avenue in November 2014. Put a stop sign just before it or at the detour so drivers have time to stop and think. Even if they continue on they won’t hit it as hard. Place another ( easily broken ) low over head restriction in front of the railway over pass. That should wake up the driver, and easily replaced. Options are move the railroad, dig down the roadway, or do a better job of warning drivers. It’s like picking your poison, but reality is the first two won’t happen. I question why CARA would spend the money other than the bridge as it looks today isn’t pretty. The chains to warn drivers of vehicles over 11’4″ is about a half block away, by the time the tall vehicle hits it, I bet the driver is past it and doesn’t hear it (most vehicles have the driver in a cab that isn’t as tall and most have Diesel engines). Warnings further back (and on side streets) with the same type of LED lighting on some cross walks today is the best option. And maybe the railroad will let the bridge be named The Murphys Law Bridge. If it can be hit it will be hit. And what makes anyone seriously think that if the folks are already ignoring the warnings in place, that they won’t also ignore additional warnings? If it isn’t already being done, how about a simple sign that says “If you break it, you buy it.” and then 1) ticket the people who ignore the signs, AND 2) make them pay for any damages or costs associated with their failure to heed the current warnings. There is a section under the Oregon Vehicle Code that requires drivers to “OBEY TRAFFIC CONTROL DEV ICES” which includes signs. Has anyone been cited for this violation when they hit the bridge? I doubt it. HH thanks for motivating me to scan through the other 50 projects from the ’01 list. I’m curious to know more about #16. Still lots to do on this ambitious list. As for the truck trap, some interesting suggestions commented here. I don’t see any mention of raising the trestle. Not viable?